Design Italian Way is a new competition organised by Fiat Auto that began today and will end in September 2007, pitting the creativeness and talents of students from eight of the most important design schools in the world one against the other. The goal? To design “the Italian way” and to stimulate ideas, proposals and suggestions for the Fiat, Lancia and Alfa Romeo models of tomorrow. The prizes are 24 grants to spend five months working full-time in the Fiat, Lancia or Alfa Romeo Style Centres. In the futuristic new premises of the Engineering & Design department’s Learning Centre in Mirafiori, the Brand Managers and the heads of the Fiat, Lancia and Alfa Romeo Style Centres met the Heads and Study Coordinators of the colleges taking part in the project: the European Design Institute of Turin, the Faculty of Design of Milan Polytechnic, the College for Creative Studies of Detroit, Coventry University of Art and Design, Tokyo Communications Arts, the Stroganov State University of Moscow, the National Institute of Design of Ahmedebad (India) and the Institute of Design of Umea University (Sweden). At the meeting, the guests were shown photographs and films that revealed how the car has changed, and how Italian design has developed over the years. Each head of the brands Fiat, Lancia and Alfa Romeo illustrated the guidelines that the work had to follow. In addition to innovation, which is common to all three brands, for Fiat, the projects must focus on dynamism, elaborating concepts for the next Panda. For Lancia, the principle will be elegance, and the development of two cars addressing two different customer targets. And finally, Alfa Romeo will focus on sportiness, with the possibility of choosing between “briefs” for three different cars. 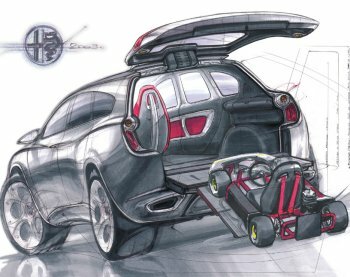 The Fiat Design Competition is an innovative project that links the world of the car with the world of design, allowing promising young designers to gain experience that would not otherwise be available to them, coming to terms with a product that is as complex, all-embracing and fascinating as the Italian car. “Design Italian Way” is a competition organised by Fiat Auto that began today and will end in September 2007, pitting the creativeness and talents of students from eight of the most important design schools in the world one against the other. Each design project must be presented in the presence of the jury, and must contain a sketchbook, plates and physical models for the exterior, with styling models (possibly in CAS), a sketchbook and plates for the interior. The organisation of the competition is simple: in each institute, the students with the most comprehensive training will be involved, and they will work on their projects during the academic year. Next June, a jury that will also include the heads of Styling for Fiat and Alfa Romeo (Frank Stephenson and Wolfgang Egger respectively) will choose the three best concepts for each school, one for each brand, which will receive the grants. The work of the 24 winners will be displayed in an exhibition organised in July, and the three projects that deserve a “special mention for the best Italian design for Fiat, Lancia and Alfa Romeo” will be selected in September (when the winners start their placement). 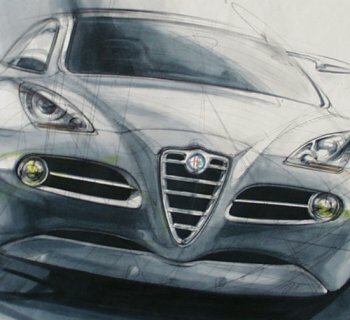 More than 140 young people from all over the world have taken part in the 2006 edition of "Stile Italiano Giovani" which was won by Ross McSherry for his design work entitled "Alfa Romeo Villa d'Este"